“Many people purchase a smokehouse, because it gives them a taste of what the generation of our grandfathers and grandmothers could eat,” an expert on fireplaces says. He is aware that majority of the population has never had the opportunity to taste the “real” sausage. It even happens that they refuse some classic products because their taste buds have become so distorted that they take the products from bought in the supermarket as the norm. There are a lot of types of the smokehouses on the market: the lightweight portable ones, the smokehouses combined with a garden fireplace, the cask smokehouses or the electric smokehouses. The prevailing materials are brick, metal and wood. The key factor in your decision should be a coherent idea of what and in what quantities you are going smoke in the smokehouse. “Your decision should be based on the space available and you should choose the location for the smokehouse, so that it matched the complex and did restrict neither you, nor your neighbours,” he advises. Thus the smokehouse, in addition to the function, also becomes an appropriate element of the exterior. Every smokehouse is unique, which depends on the ideas of the person who built it, as well as on the space available. However, in their principle, they work in a similar way. The scheme of a home smokehouse can be divided into four parts: it consists of a fireplace, a flue, a smoke box and a chimney. For the proper function of the smokehouse, it is essential to observe the following rules, which must be taken into account when you consider the location of the smokehouse. Fireplace must be placed lower than the smoke box and must be smaller than box. Inside, there is a grate with an ash pan underneath it, from which the collected ash must be removed. 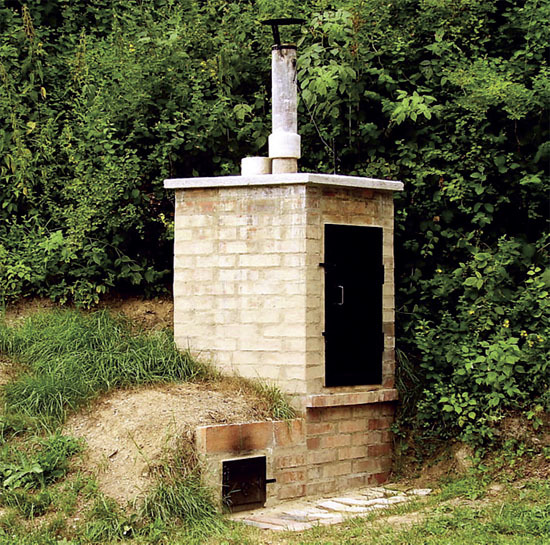 Flue: its inclination is given by the height difference between the fireplace and the smoke box as it interconnects these two parts; it is usually 2-4 m long. 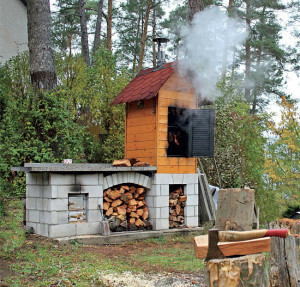 The Smoke Box: its size should correspond to the intended amounts of the sausages or meat; the smokehouse is a very complex device and can be enhanced with many tricks; it can be built as a part of the kitchen garden, too. Smoking With The Cold Smoke: it is performed on the dry sausages and salamis; you put them in the smokehouse heated to 40 ° C, until they get dry and then reduce the temperature to 20 ° C. They should be exposed to the smoke for a day minimally, for 2-3 days better yet. Smoking With The Warm Smoke: it is the most common in our homes: the raw meat is heated in warm water of about 60 ° C and then hung in the smokehouse, which has been preheated to the same temperature; the meat remains in the smoke for about 6 hours. These products are not as durable as the ones smoked with the cold smoke, they are however suitable for the direct consumption and the smoking time itself is quite short. Smoking With The Hot Smoke: it is not suitable for the sausages, as their casing would crack. Let the meat get soused for 3 hours minimally and get it drained. Then put it into the smokehouse preheated to about 60 ° C and increase the temperature gradually up to 90-100 ° C. The overall smoking time is 1 – 1.5 hours. While smoking the meat, it is necessary to add wet sawdust to the fire, as the wood itself does not produce enough smoke. The small portable smokehouses are the cheapest. The more expensive are the middle class portable smokehouses, which can hold up to 12 kg of meat, and are intended for all kinds of smoking. The smokehouses with the insulation, which are designed to operate all year round, are the most expensive ones. 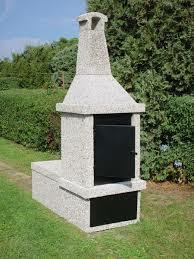 The smokehouse can become a part of a garden kitchen and can be a supplement to the most used grill. In this case, it is recommended to get an architect who is experienced in planning the garden fireplaces and garden kitchens. And if you are interested in building it yourself, there is a specialized technical literature available for you.